OneDrive backup utilizes the Microsoft OneDrive cloud service for both backing up data to it or copying cloud content to another place. 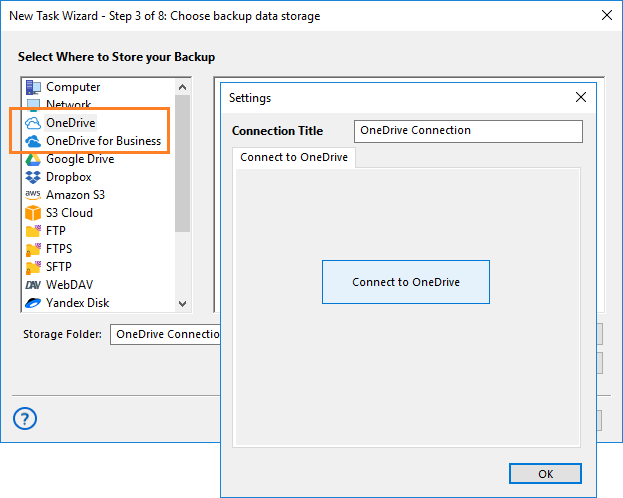 Handy Backup can either automatically perform standard OneDrive backup, or serve as OneDrive for Business backup solution. With Handy Backup, you can choose any destination to OneDrive backup, from local “My Documents” folder to FTP server to some remote vault. You can even backup OneDrive to Google Drive or to some other cloud (such as Dropbox, OwnCloud, Amazon S3) for guaranteeing safekeeping your information..
A cloud service such as Google Drive, Dropbox, Amazon S3 etc. When you want to do it. Handy Backup allows some options to start your backup to OneDrive Windows software task: manually when you want, at an exact time with an interval from minutes to months, by user logon/logoff to a system or by plugging a task-related external USB drive into your PC. Open Handy Backup. Create a new task through a menu or by clicking a main panel button. Select a backup task and go to Step 2. Select data you will plan to back up to OneDrive. Attention: Be sure that your OneDrive account size has enough storage capacity to save your backups. For example, you can require much more than a basic storage of 5-15 Gb to make a hard drive backup or to save a database content to OneDrive! 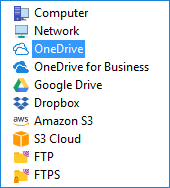 Choose OneDrive plug-in as a data destination. You will see a new dialog, to make a connection click the "Connect to OneDrive" button. 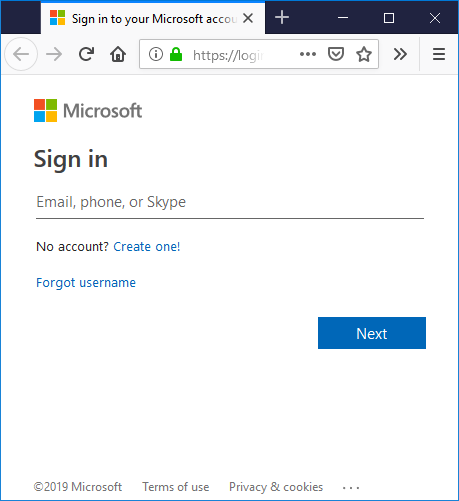 In the window appearing, enter your account login and password and then connect to OneDrive. After greetings, return to the task creation wizard and continue. 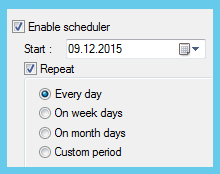 Choose any other task parameters, such as backup type, encryption and scheduling. Finish the task creation wizard by giving a name to your task. Your OneDrive backup task is ready for executing. Start it manually at any time you will want, or wait for a scheduled period or event to run it automatically. You can also create tasks using OneDrive as backup source, with selecting and configuring OneDrive access at the Step 2 instead of the Step 3. To perform backup of OneDrive for Business, the versions 7.12 and newer contain a separate plug-in with the same name. This plug-in can backup OneDrive for Business data, as well as synchronize and restore these data by just the same way as the standard OneDrive plug-in. Handy Backup has a capability to synchronize data between different OneDrive accounts, or even between OneDrive and other storage folder. To make an OneDrive sync task, select “Sync” as the task type on Step 1, and continue making a task as usual (including creating connections as described here). 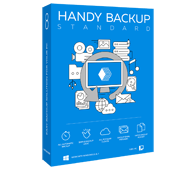 All editions of Handy Backup including the Standard edition allow you to use OneDrive backup application and folder to store your data to OneDrive. Free 30-days trial version! Saving crucial data such as settings, phone contacts or a device hard drive to OneDrive. In addition, some options such as camera roll (automatic backup to OneDrive with your tablet or laptop camera), automatic upload of some music from your phone and other functions are available with the specialized OneDrive app. However, none of these functions can replace Handy Backup. Handy Backup is a very capable solution for Microsoft OneDrive backup. It operates directly with the OneDrive cloud, allowing daily using all its advantages (such as incremental OneDrive backup to NAS or to a network drive) in a single automatic, user-friendly and technically equipped program. Built-in OneDrive functions for sharing documents are somehow limited. Handy Backup allows users to upload and download files online as frequently as they need, making a perfectly linked environment for synchronizing online and offline operations for working with OneDrive. Microsoft products are prone to compromising with malware and stealing actions. Handy Backup contains a built-in encryption algorithm, capable to protect your data either when transferring dataset online or when storing it in an OneDrive. Unless you encrypt your information, you can always browse, view, modify or share any data stored to OneDrive with Handy Backup directly in a cloud, because Handy Backup preserves native data formats when creates a backup dataset. Use your OneDrive backups without a need for restoring! Learn how to backup files to OneDrive or backup OneDrive account itself automatically with Handy Backup. Handy Backup is perfect OneDrive backup software, allowing your synchronizing your files, settings and device content to a popular Microsoft cloud storage service.